In order to mount and coordinate an effective immune response, a mechanism by which lymphocytes, inflammatory cells and haematopoietic cells can communicate with each other is required. Cytokines perform this function. Cytokines are a large, diverse family of small proteins or glycoproteins (usually smaller than 30 kDa). Although initially described for their immunomodulatory capabilities, additional roles separate from the immune system in developmental processes are also documented, such as cell differentiation and directed migration. Influencing both innate and adaptive immune responses, the two principal producers of cytokines are helper T cells (Th cells) and macrophages, although they can be transiently induced and secreted by virtually all nucleated cells. 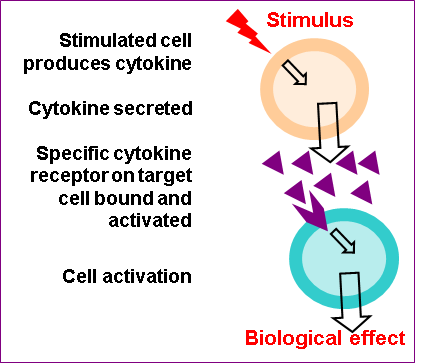 The downstream effects of a particular cytokine occurs through its high-affinity binding of its receptor expressed on the surface of a target cell. This action may occur in an autocrine (acts on same cell), paracrine (acts on nearby cell) or endocrine (acts on distant cell; not the normal manner for cytokine responses) manner. Receptor engagement triggers intracellular signalling cascades leading to altered gene expression in the target cell, which lead to a biological effect (Figure 1). Differentiation, proliferation and activation of the target cell are all effects which can be detected after cytokine stimulation. Figure 1. 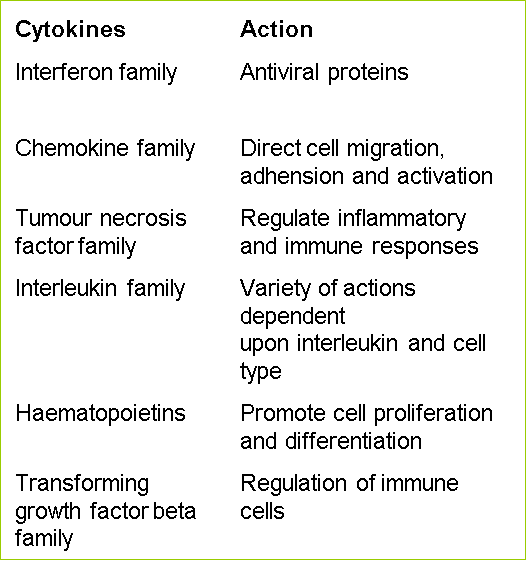 Cytokine mode of action, with specific examples. The multiple cytokines detected in the extracellular milieu at any given time during an immunological response can interact in pleiotropic (different effects on different types of target cells), redundant (multiple cytokines have same effect), synergic (cooperative effect of multiple cytokines), antagonistic (inhibition of one cytokines effects by another) and cascade induction (multiple-step feed-forward mechanism for the amplified production of a particular cytokine) manners. These interactions make it possible for the coordinated recruitment and activation of an entire network of immune cells by a relatively small number of cytokines produced by a single cell type (e.g. macrophages or Th cells). Activation by cytokines occurs in an antigen-non-specific manner and must, therefore, be regulated to avoid inappropriate responses in a host’s system which would be detrimental to health. In healthy individuals, cytokine action is regulated by their transient production only in response to either antigen or potent inflammatory stimuli, the short half-life of cytokines in extracellular fluids and compartments, and the restricted receptor expression profiles on the surface of both activated and unactivated target cells, as well as other mechanisms. Of course, there are examples of cytokine dysregulation which result in pathological disease. Such an example is the role of tumour necrosis factor alpha (TNFα) in the development of rheumatoid arthritis; blockade of this cytokine’s effect through the administration of a recombinant soluble TNF-receptor also exemplifies how understanding these molecules can be exploited with medical benefits. Colony stimulating factors (CSF) are part of the haematopoietin family of cytokines. 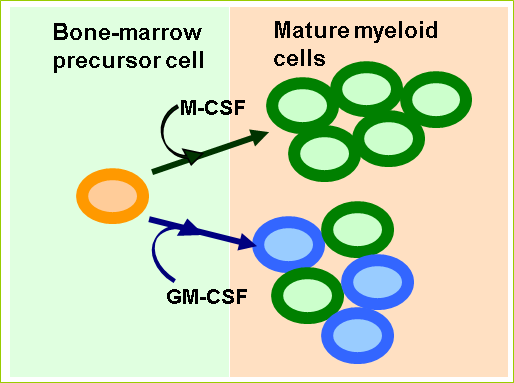 Macrophage-CSF (M-CSF) and granulocyte/macrophage CSF (GM-CSF) induce the proliferation of naïve bone marrow precursors and their differentiation into macrophage colonies and granulocyte and macrophage colonies, respectively (Figure 2). CXCL10 (also known as IP-10) is a chemokine is secreted by IFNγ-stimulated cells. Only T helper 1 (Th1) cells expressing CXCR3, the receptor to which CXCL10 binds, are able to detect this chemokine and migrate towards it. 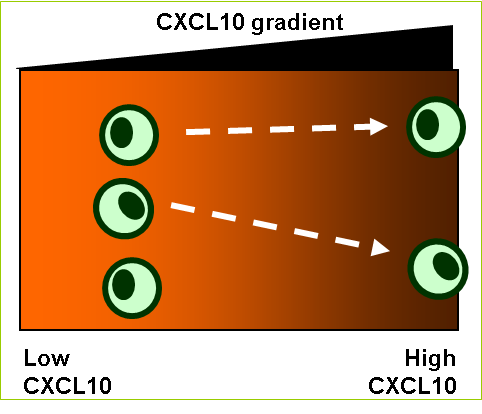 CXCL10 induces the migration of Th1 cells from areas of low CXCL10 concentrations towards areas with high concentrations of the molecule, such as the site of an infection and inflammation (Figure 3).